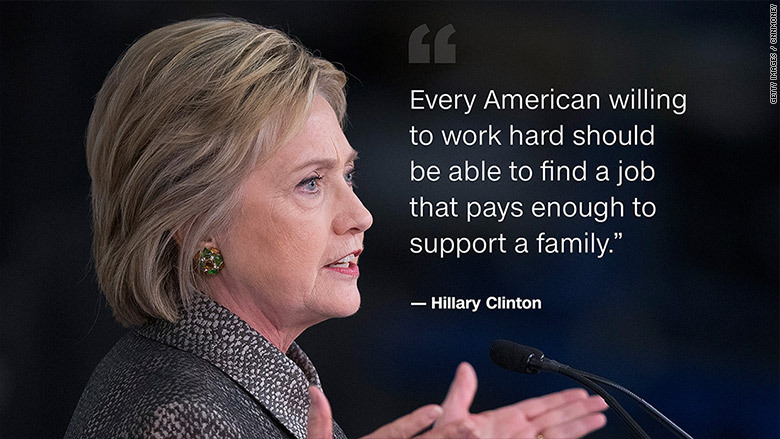 Hillary Clinton says it's time for a new chapter in the American Dream. "I have a clear vision for the economy and it's this: We need to make sure our economy works for everyone, not just those at the top," Clinton said Wednesday in a speech in Raleigh, N.C.
5. Put "families first" in the economy by raising the minimum wage, enacting paid family leave and expanding preschool for all. In her first 100 days in office, Clinton vows to enact a massive $275 billion investment in infrastructure. This would fix America's roads and bridges and expand technology access, creating good-paying jobs, she said. "The heart of my plan will be the biggest investment in American infrastructure in decades," she said. "When your paycheck grows, America grows." Her infrastructure plan has been widely praised by economists across the political spectrum. While some quibble with the details, there's a consensus that America's infrastructure is in massive need of repair and that this kind of investment would be a boost to the economy. "Roads, bridges, sewers, water. You name it, we are lagging," says David Kotok, chairman of Cumberland Advisors, an investment advisory firm. "The United States needs somewhere between $3 trillion and $4 trillion of infrastructure spending." Clinton contrasts her detailed plans for the economy with what she calls Donald Trump's flimsy and "reckless ideas that will run up our debt." She cited research from Moody's Analytics that Trump's plan would lead to a recession and 3.5 million job losses. Republicans are "still in grips of a failed economic theory called trickle-down economics...but it has been proven wrong again and again," Clinton said Wednesday. Clinton is firm that she will not raise taxes on the middle class, a wide group that she defines as those earning under $250,000 a year. Instead, she says she'll fund her proposals by making the rich pay more in taxes. "When people say the game is rigged, the best evidence is the tax code," she said. She wants to enact the so-called "Buffett rule," named after billionaire Warren Buffett, that would require anyone earning over $1 million a year to pay at least 30% in taxes. There would also be a 4% surcharge on incomes over $5 million. Clinton's tax plans wouldn't add to the debt, according to the Tax Foundation. Instead, Clinton would actually end up with more revenue for the government, which she plans to spend. The extra money from the top 1% would go to what Clinton calls the "family first" economy. She wants to expand grants to college students with the goal of making college debt-free (although students and their families would still be expected to contribute something to the costs). She also wants to make pre-school available to all, enact paid family leave so new mothers and fathers can take time off without losing their job or income entirely, and she supports the minimum wage going to at least $12 (it's currently $7.25 nationally). The final push in Clinton's five-point plan is getting businesses to share their profits with workers. We must "rewrite the rules so more companies share profits," she said, noting that Americans deserve a raise and this is one way to encourage higher pay. Alan Blinder, a Princeton professor and economic adviser to Clinton, told CNNMoney that it's one of her best ideas that hasn't received enough attention. The concept is simple: When companies make a lot of money, the workers get a cut of the rewards. Think of it like a commission. Clinton's proposal is to give a tax credit to companies that do this. Over the years, corporate programs to encourage employees to buy stock in their companies have dramatically declined. Twenty years ago, 28% of companies had employee stock plans (a form of profit sharing), according to the Society of Human Resource Management. Today only 9% do.